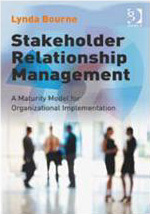 The 2nd Edition of my book, Stakeholder Relationship Management: A Maturity Model for Organisational Implementation is one of Gower’s Top 20 selling e-Books in the period Jan – June 2013. For the other books in the ‘Gower top 20’ download the PDF. The take-up of the book and our software, the Stakeholder Circle® by universities over the least few months has been really encouraging. Now all we need is the commercial world to follow.